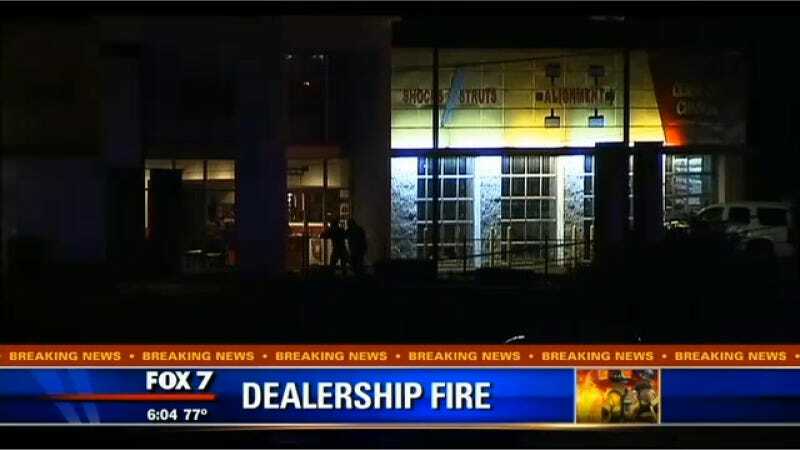 I think everyone has thought about torching a car dealership at least once, but it takes a special kind of person to actually do it — especially naked and at 2:30 a.m. That's what authorities say a man did in Austin this morning prior to his arrest on arson charges. The Austin American-Statesman reports that an unnamed suspect broke into the used Nissan dealership on the northbound service road of Interstate 35 near William Cannon Drive where he called 911 and hung up around 2:30 a.m. He triggered a two-alarm blaze when he lit some office furniture inside on fire, but the fire died out on its own, officials said. Firefighters and a police SWAT Team arrived at the dealership and tried to coax the man outside. Eventually he ran outside around 8 a.m. — without clothes, perhaps to save weight and thus increase his running speed — when he was caught by police dogs. Authorities haven't said whether the suspect has a connection to the dealership or not. Maybe he's just a Ram guy pissed about the Cummins thing.